Understand how to change the settings for your connections with Social Engagement, and the consequences of doing so. You must already have a working connection established and you need to be have an Administrator role in Social Engagement to perform the following tasks. The associated Customer Engagement instance has been disabled or deleted in Social Engagement. The associated Customer Engagement instance is experiencing downtime, or has expired. The Customer Engagement instance is enabled, but the Customer Engagement record has been disassociated from the social activity, or has been deleted, or, in Social Engagement the linked Customer Engagement record has been unlinked from the Social Engagement post. After you connect a Customer Engagement instance to Social Engagement, it will show in the list on Settings > Connections > Microsoft Dynamics 365. Click the row associated with the connection to open the Dynamics 365 for Customer Engagement Instance pane. Name: Shows the name of this connection to identify the Dynamics 365 for Customer Engagement instance quickly when creating a social activity. The display name corresponds with your organization name in Office 365, unless a Social Engagement administrator changes the name while setting up the connection. 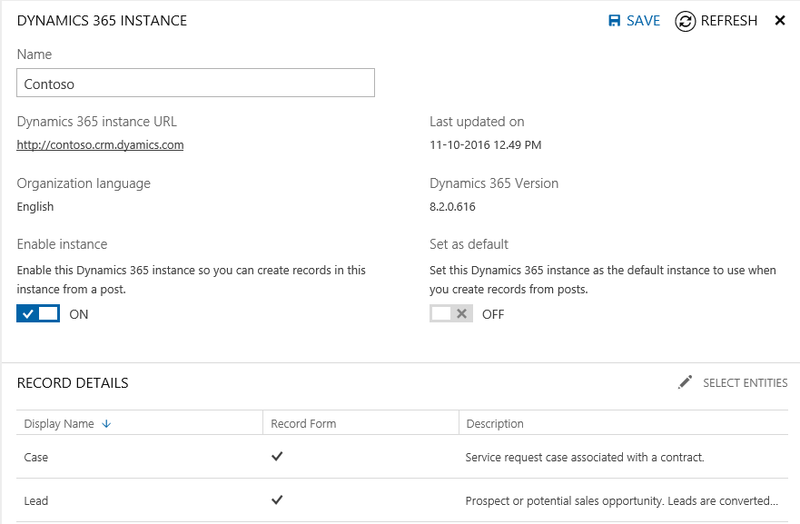 Dynamics 365 Instance: URL for your Dynamics 365 for Customer Engagement instance. Organization language: See the organizational language of your Dynamics 365 for Customer Engagement instance. Connected on: Shows the date and time when the connection between Dynamics 365 for Customer Engagement and Social Engagement was established. Set as default: Lets you choose to have an instance selected by default when creating new links to Customer Engagement records from social posts. Enable instance: Lets you choose to temporarily disable the creation of new links to Customer Engagement records from social posts. Refresh: Lets you update the metadata of all Dynamics 365 for Customer Engagement entities associated with that Customer Engagement connection in Social Engagement. Make the necessary changes to the metadata and then click Save to apply the changes. If your organization maintains multiple Dynamics 365 for Customer Engagement instances, you can connect Social Engagement to more than one instance. In this case, you can set the instance as a default connection that will be used most often to create new records in Dynamics 365 for Customer Engagement apps. Users can choose a different instance when creating a new Customer Engagement record. In Microsoft Social Engagement, go to Settings > Connections > Microsoft Dynamics 365. In the Microsoft Dynamics 365 Connections pane, select the instance you want to set as the default. In the Dynamics 365 Instance pane, set the Set as default option to ON. You can delete already-established connections between a Social Engagement post and Dynamics 365 for Customer Engagement record at any time if you don’t want to create new records in the connected Customer Engagement instance anymore. If you maintain more than one connected Customer Engagement instance, you can delete one connection and still use the other connections. No new Customer Engagement records can be created after deleting a connection to a Customer Engagement instance, unless a connection is re-established. Removing a link from a Social Engagement post will not affect the Customer Engagement record or social activity at all. You can delete connections if you don't want to create new records in a Customer Engagement instance anymore. You can't delete a connection if there are active automation rules that link posts to the connected Customer Engagement instance. You will first need to deactivate or delete all automation rules using that connection. Find the connected instance in the list of Microsoft Dynamics 365 Connections. Click the Delete this connection to Dynamics 365 button . You can delete already-established connections between a Social Engagement post and Dynamics 365 for Customer Engagement record at any time if you no longer want to create new records in the connected Customer Engagement instance. If you maintain more than one connected Customer Engagement instance, you can disable one connection and still use the other connection. If you maintain one single connected Customer Engagement instance, you can disable it but you won’t be able to create new external links from Social Engagement. The following table summarizes the impact on a Social Engagement post when the status of an associated Customer Engagement instance changes. Deleted - The Social Engagement post is available to be linked again. - If the Social Engagement post is re-linked to another instance and the previously deleted Customer Engagement instance is re-associated win Social Engagement, don’t search for the original links and do not change the established link. - If the Social Engagement post is not re-linked and the deleted Customer Engagement instance is re-associated, establish the original link (provided Customer Engagement social activity is available). - The Customer Engagement instance is marked as disabled and is not available in the list of instances when creating a Customer Engagement link. - Social Engagement is available for linking to any enabled instance selected by the user. Disabled - The Social Engagement post retains the link and shows an error message because the link will fail to load. - The Customer Engagement instance in Social Engagement is marked as disabled. - In Social Engagement, a user can unlink the post to make it available to link with another valid Customer Engagement instance. Same as above. Downtime Same as above. Same as above. Expired - The Social Engagement post retains the link and shows an error message because the link will fail to load. - The Customer Engagement instance is marked as disabled. - In Social Engagement, a user can unlink the post to make it available for linking to another valid Customer Engagement instance. Same as above. The following table summarizes the impact on a Social Engagement post when the status of an associated Customer Engagement record changes. The Customer Engagement record has been dissociated from the social activity. - The linkage with the Social Engagement post is broken. If you don’t want new records created in a Customer Engagement instance temporarily, without deleting the connection, you can also disable the connection to an instance. You can't disable a connection if there are active automation rules that link posts to the connected Customer Engagement instance. You will first need to deactivate or delete all automation rules using that connection. Set the Enable instance option to OFF. If your Customer Engagement instance has expired or is in maintenance, details for linked Customer Engagement records won’t be shown in Social Engagement. By enabling Microsoft Social Engagement to connect to Dynamics 365 for Customer Engagement, you will allow data to be sent to Customer Engagement apps using an individual action on a post or automation rules. Customer Engagement apps store the data from Microsoft Social Engagement as a SocialActivity and a SocialProfile entity, and subsequently may convert the SocialActivity into a different record type based on predefined rules. Any Customer Engagement user with the required permission to access Customer Engagement records will be able to access and/or process this data. Note that the data sent from Microsoft Social Engagement includes both Social Content and customer data. Specifically, the data includes Social Content information about the social post (author and text) as well as customer data in the form of enriched information, such as sentiment and tags. For complete information about the content of the data sent to Customer Engagement apps, please see the payload properties topic.